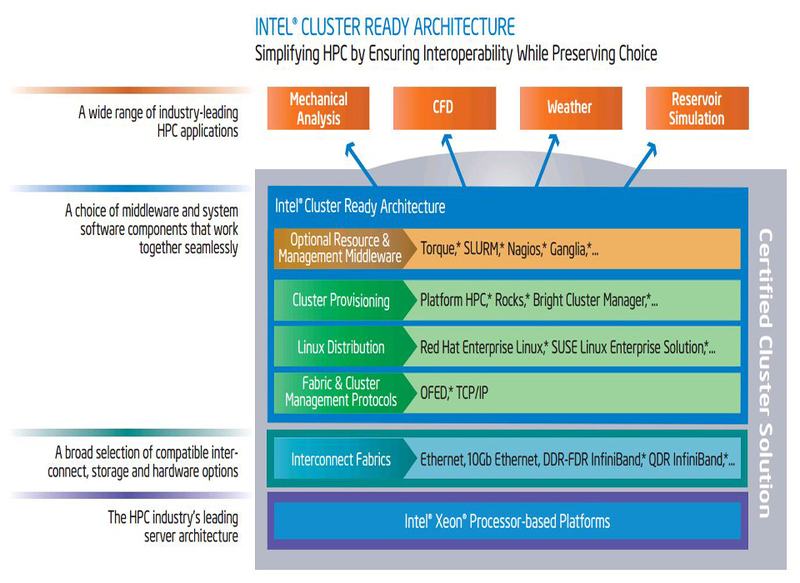 Intel® Cluster Ready architecture and program makes it easier to gain the performance advantages of HPC clusters. Developed with hardware and software vendors, Intel® Cluster Ready lets you match your HPC applications to today’s leading platforms and components. Pre-configured cluster solutions are delivered ready to run, so you can unleash more parallel performance faster. Intel® Cluster Ready architecture means pre-tested interoperability, so you realize HPC benefits faster. Intel® Cluster Ready solutions come with the Intel® Cluster Checker tool, to validate that the cluster remains within certification over time and troubleshoot any problems that occur. The result: greater productivity and higher return on your HPC investment. Match certified systems with registered applications and enjoy the freedom to focus on purchasing the configuration that best fits your application workload – without worrying if components will work together. More Performance, Fewer Hassles. Clusters Made Simpler. Put more power behind your high-performance computing (HPC) applications. Choose certified Intel® Cluster Ready systems and registered applications. Be confident your cluster will work as it should, right away.